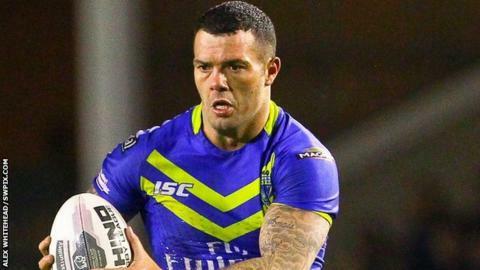 Warrington's Chris Bridge clocked up a 36-point individual haul as the eight-times Challenge Cup winners crushed Doncaster at the Halliwell Jones. Stand-off Bridge got the first two of his four tries before the break, Kevin Penny, Matthew Russell and Ryan Atkins crossing too for a 30-0 half-time lead. Wire then added seven more tries after the break, Bride adding another two. Doncaster player-coach Paul Cooke was a Challenge Cup matchwinner with Hull FC in the 2005 final. Penny added two more to complete his treble, while Brad Dwyer, Joel Monaghan and Rhys Evans also crossed. Penny's hat-trick try was a 60-metre sprint late on as Paul Cooke's side began to tire after a huge effort. Bridge, 29, who has played much of his career in the centres, came into the halves in place of the injured Stefan Ratchford. "Chris was on fire. He was terrific. He was keen to step into the stand-off position when he heard Stefan was out and he's backed that up with a very good performance. "He was one of the shining lights, but there were plenty of them today and another was Kevin Penny, who read the play very well and was smart in the way he turned up for his tries. He's progressing well. "Doncaster could easily have thrown the towel in, but they made us earn every point out there. I didn't think they gifted us anything. They fought really hard and I can see why they are sitting high in the Championship because they have a real spirit about them and some talented players. "But it as professional and committed performance from us because we could quite easily have dropped off at some stage but we didn't and that's evident with the nil scoreline." "With all due respect to the competition, we were never going to win it. "It's vital we don't let today's result affect us for the next month to six weeks. "I know more than anyone else how great this competition is. "But when there are five teams relegated from the division we are in, you have to look after number one." Warrington: Russell; Penny, Atkins, R Evans, J Monaghan; Bridge, O'Brien; Hill, Higham, England, Currie, Laithwaite, B Evans. Replacements: Asotasi, Waterhouse, Riley, Dwyer. Doncaster: Waterman; Scott, Leaf, Welham, Morrison; Wilkinson, Wildie; Spiers, Kesik, Green, Starling, Kent, Robinson. Replacements: Edwards, Spaven, Carbutt, Wilson.